Santa Barbara, Calif.- The Belmond El Encanto is offering discounts of 50 percent or more off of rooms for any local residents seeking shelter after being evacuated due to the local flooding or mudslides. The luxury hotel is offering the steep room discounts as an official sponsor of the Global Citizen Club, a new initiative started this year by the World Business Academy. The goal of the Global Citizens Club is to foster a supportive network of local individuals who donate to not-for-profit groups focused on solving the most pressing social and environmental challenges of our time. Active donors in participating nonprofits can receive discounts at the Belmond El Encanto and other local businesses who give back to the community. The Belmond El Encanto is located at 800 Alvarado Place in Santa Barbara. The phone number is 805-845-5800. Any local resident seeking a room due to being evacuated may ask for the evacuation rate at the front desk. The El Encanto also offered deeply discounted rooms to local evacuees of the Thomas Fire. “I would like to commend the Belmond El Encanto for its sense of civic responsibility and its commitment to serve the local population with quality information and excellent hospitality,” said Rinaldo S. Brutoco, founding president of the World Business Academy, now in its 30th year. The Belmond El Encanto is hosting the first meeting of the Global Citizens Club on Jan. 18 and will host monthly meetings of the club moving forward. Notable speakers and dignitaries will be invited as guests. 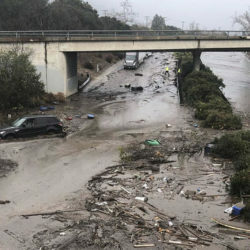 Flooding and mudslides resulting from heavy rains on Tuesday, Jan. 9 are being blamed for at least eight deaths in the Montecito area as of mid-afternoon, and numerous rescues from homes and vehicles, including the dramatic rescue of a 14-year-old girl who was stuck for hours in mud in a destroyed home. Highway 101 was closed between Ventura and Santa Barbara due to flooding and debris, along with other roads.